The Dominical area is mostly famous for its fantastic surf location. The beach in Dominical provides world renowned waves that can reach up to 10ft in height, and attract surfers from all across the globe. However the area has more to offer than just surfing. It is also great for swimming, sailing, hiking, action sports and for its wildlife. The area is home to one of Costa Rica´s most famous waterfalls, Nuayaca. This incredible multi story waterfall is over 45 meters in height. It houses several breathtaking swimming areas that would be a shame to miss for anyone visiting the area. To get to the bottom of the waterfall it requires a hike around 30-45 minutes. If you are not into hiking there are options to take horseback rides or even ATVs for most of the trip. Just outside the beach you find the entrance to the jungle. There are many reserves and tours in Dominical where you can see an incredible amount of wildlife. In fact Costa Rica is a major destination for anyone interested in ecotours.There are also the options of Corcovado and Manuel Antonio nearby. Manuel Antonio is one of the most visited locations in Costa Rica and can provide a more touristic centric experience for the whole family. It is also worth mentioning that the area of Uvita is one of the most popular areas in Costa Rica for seeing the whales. There is even an area known as “The Whales Tail” where when the tide is low a small stretch of land extends into the ocean in the shape of a whale. Be careful though as later in the evening this land mass completely disappears as the tide rises. There are many other activities to enjoy in the Dominical area. Some of these include zip lines, hiking, ATV and horseback tours, snorkeling with dolphins and whales, surf camps, rafting and kayaking. That is just to name a few! The area is full of options for any type of adventurer. With so many options you can check out our guide for planning a trip to Costa Rica. Dominical is roughly a 3 to 4 hour drive from the Juan Santamaria Airport. It can take even longer by bus. The roads to Dominical are mostly highway and high quality so the drive should be smooth and pleasant. The area around Dominical is however much more rural. There are not a large amount of hills or exceptionally rough roads. Though when it rains many of the roads will have large puddles and deep mud that may not be passable with a typical car. Due to this and the many sandy areas we highly recommend a 4×4 vehicle with higher ground clearance. This is to avoid getting stuck while on your vacation and allow you to experience all the unique beaches in the area. The highlight looks really capturing..Costa Rica itself is a must go place !! Absotlutely! 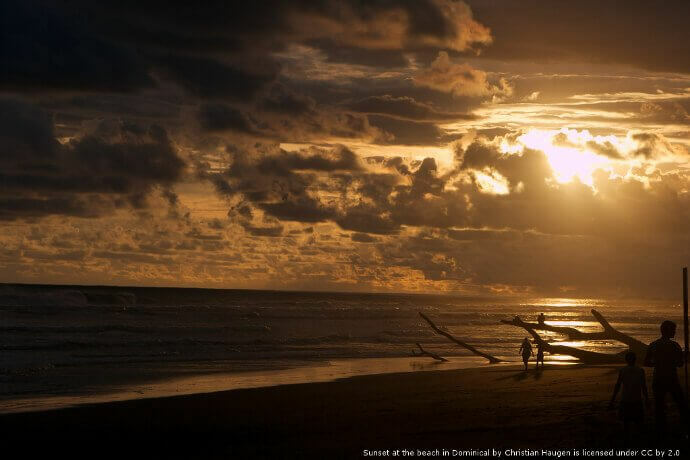 Dominical is my favorite area here in Costa Rica. If you get a chance make sure to visit Nauyaca Waterfalls, it is incredible.